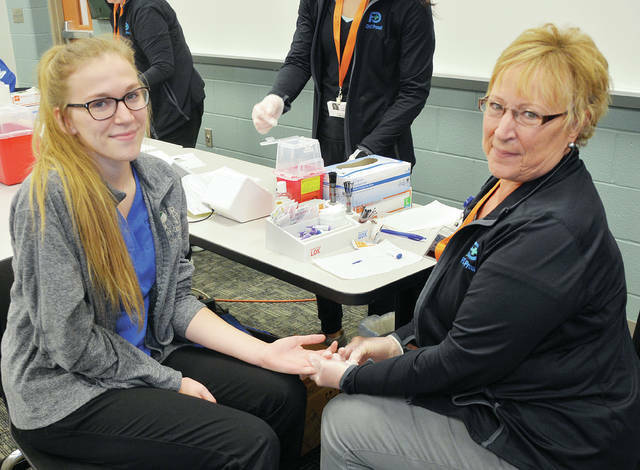 Four County Career Center seniors in Archbold recently took part in a free cholesterol screening offered by the Corporate and Community Health Promotion Team of the Fulton County Health Center (FCHC) in Wauseon. The screen was made possible through monies raised from the yearly Fulton County Heart Radiothon. Shown with FCHC Cholesterol Screener Danette Borck, right, is Morgan Couts of Wauseon. https://www.fcnews.org/wp-content/uploads/sites/45/2018/11/web1_2018-cholesterol-screening.jpgFour County Career Center seniors in Archbold recently took part in a free cholesterol screening offered by the Corporate and Community Health Promotion Team of the Fulton County Health Center (FCHC) in Wauseon. The screen was made possible through monies raised from the yearly Fulton County Heart Radiothon. Shown with FCHC Cholesterol Screener Danette Borck, right, is Morgan Couts of Wauseon.